Responsible for all strategic initiatives, operating practices, budgets, general producing of jobs, and real estate management. In Your Ear is a full service production and postproduction facility located in Richmond, Va. IYE enjoys a strong national reputation for producing quality product and providing superior account customer service. We produce work for all levels of clients. Jobs can include television or radio commercials, live webcasts, corporate presentations or web videos. I have produced jobs for major corporations, Hollywood film studios, assorted universities and numerous advertising agencies. Recent clients include The Virginia Lottery, Tidewater Community College, Anthem/ Blue Cross Blue Shield, the City of Richmond Economic Development Department, and The Mariners Museum. Virginia Production Alliance- 1988 to present. 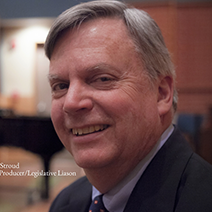 I am one of the founders of the Virginia Production Alliance. The Alliance represents the film, video and audio industries in the Commonwealth of Virginia. I have served as the President or Chairman for a number of years. Presently I am the Chairman of Legislative Affairs and oversee the legislative efforts of the industry statewide. I work with the membership, lobbyists, legislators and the Governor’s administration to facilitate the goals, message and execution of the annual legislative initiative. I have also served on multiple Gubernatorial transition teams regarding the film and tourism industries in the Commonwealth. I was appointed to the VTC Board in 2014 and currently I am actively involved in film and tourism issues in the Commonwealth. Education: University of Richmond. Graduated 1974. Psychology. Personal: Married with three children.